My breakfast cookies were one of the first recipes I featured on my blog almost 2 years ago. Hard to believe I've been blogging for about two years now but not hard to believe I haven't stopped eating these cookies! They're all natural and made with no added sugar or flour: my kind of food. The base is simple: bananas, pumpkin, applesauce, peanut butter, and oats. I add protein powder or chia seeds for extra energy but you can add nuts, shredded, raisins, flaxseed, different spices, or anything you want really; they're very forgiving. I've been making them every other week or so and they make for a perfect grab-and-go breakfast or afternoon snack with no oatmeal to make and no bowl to clean afterward. I've given the recipe to a few people, but it's only fitting that I my first recipe here again to show off my new camera and lens! I've been lusting after a DSLR camera for years now. In anticipation of future trips and future food (always), I finally bit the bullet a few weeks ago and decided to order the most basic DSLR model with good reviews, the Canon T3 Rebel. Then I had to decide which lens I wanted, the "nifty fifty" 50mm f/1.8 lens or the pancake 40 mm f/2.2 lens. After reading dozens of reviews and watching videos comparing the two, I finally ordered the 50mm f/1.8 and I love it so far. The picture quality is sharp and crisp and the bokeh effect (blurry background) is exactly what I was looking for. However, I didn't realize how shallow the depth of field was, meaning it's good for taking portraits or closeups of food or flowers but not a great walking around lens for taking normal pictures of people, scenery, landscapes, etc. I haven't figured out how to circumvent that problem yet (maybe just stand a mile away from whatever I'm trying to shoot), but for now I'm having fun with my new toy. Ok, enough technical jargon, more FOOD PICTURES! And a recipe. 2-3 medium mashed bananas. The browner your bananas, the sweeter your cookies will be. 2. In a large bowel, mix the first 5 ingredients together well. 3. Add the dry ingredients to the bowel, adding the oats in last, and mix to combine. 3. Let mixture rest for 10 minutes. 4. Using a 1/4 cup measuring cup or scoop, make burger size patties with your hands and lay them on a nonstick shee tpan. Cookies will not spread, so lay as many as you can onto the sheet. 6. Bake for 23 minutes or when the edges are slightly golden. Baking for 23 minutes in my oven will make soft, pillowy cookies. Leaving in for an extra minute or two will result in a firmer cookie. 7. Let rest on baking sheet for 5 minute, then transfer to baking racks to cool. Cookies will keep in the refrigerator for one week. 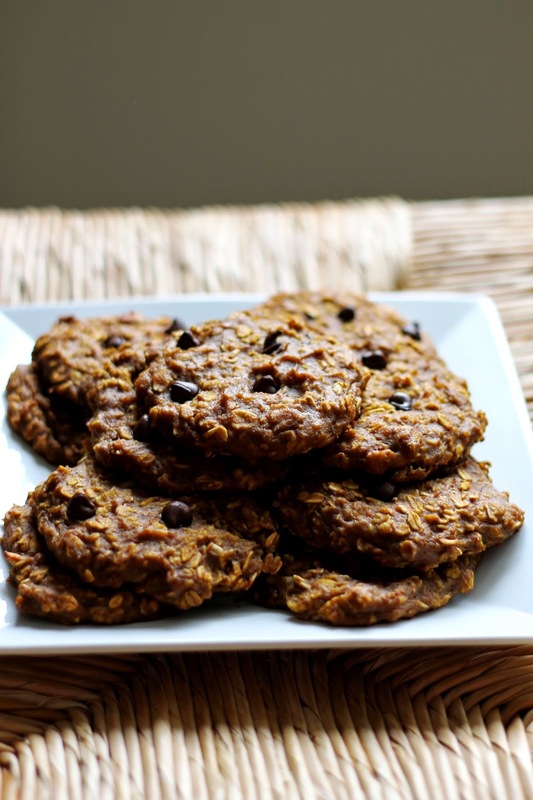 They are not chewy or crispy like a normal cookie, but soft and pillowy (due to the pumpkin) like a bowl of pumpkin spice oatmeal in cookie form. I've experimented with different add-ins and spices and made chocolate cookies (add 1/3 cup cocoa powder), gingerbread (scale back on the cinnamon and add 1 tsp ground ginger), and even chai flavored cookies (scale back cinnamon and add 1/2 tsp ground cardamom), but you can never go wrong with the original. If you see me in the morning, I'll nearly always be eating my breakfast cookie during morning report or sneaking bites from my white coat pocket. I almost always have a batch in my fridge so ask me to try one. Or better yet, make them yourself to create your new favorite grab and go breakfast! dslr pictures makes everything look 100000x more amazing. I just made these for me and my daughter. Wonderful! Will definitely try with protein powder added next time. I'm wondering if you could put it into an 8x8 and do a bar or brownie style.